Wayfaring Wanderer: Greeting from Boracay! My Dad left for the Philippines a couple weeks ago. Spending time with his Mom, as well as, brothers & sisters. My Dad has about 7 brothers and sisters! All of which I have never met before, my grandmother included. My middle name was chosen with my grandmother in mind, Elena. Sometimes, I wish that were my first name.....it's such a pretty name. I sincerely hope that one day in the very near future I will be able to venture to the Philippines to meet my extended family. My Dad is staying for a little over a month, I'm jealous. He says that one day he plans to retire there.....when that day comes, maybe I'll go live with him for a while and discover my roots?! I'm not really a lay-out-at-the-beach kind of girl, but there is a lot more to the beautiful islands than the sandy beaches. 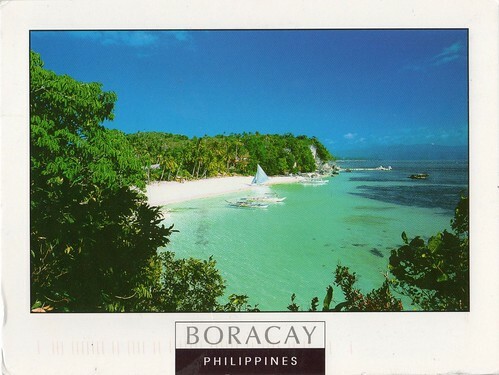 This postcard makes my heart ache, and ignites a wildly untamed wanderlust that won't be satisfied any time soon. Having a greeting from a place of the heart, especially one with a genealogical tie, is such an exciting thing. What a thrilling journey for your father! 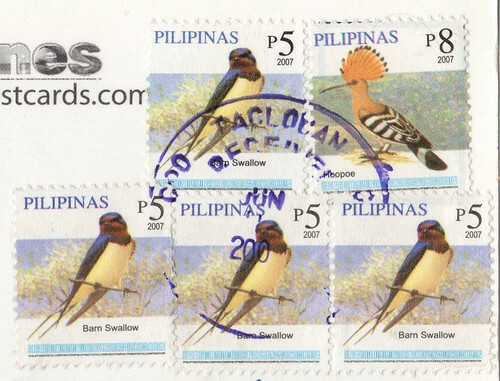 I have developed a fast friendship with a young man in the Philippines in the last few months, and he sent me the most gorgeous postcard from there with the dearest note. It does look like a beautiful beautiful place. My nephew was married to a girl from the Philippines and they had two sons (very handsome). Wow - sounds like a wonderful place! My co-worker's name is Elena...it is very pretty. It makes me want to travel too but I am a lay on the beach kind of guy so I would stay there. I always hated having such a popular name, I always knew like 5 other girls with my name in school! greg: I plaster all of my postcards here at work, I catch myself daydreaming A LOT! I would enjoy the beach, but I'd would like to explore less touristy places as well. Boracay is very very touristy! Awwww... That looks amazing! I would love to visit there. Among many other places. Looks as if your Dad is fallen in love with Boracay .. I fully understand ! One time Boracay .. forever Boracay ! It looks truely beautiful. I hope you get a change to go there one day and meet your family too. That would be an adventure. TD: Well thank you deary! oceanbreeze: My Dad isn't actually in Boracay, but I'm sure he's been there before. bobbb: Thanks for stopping in! Love the picture. I am not a total beach nut either but who can turn away from gorgeousity (sorry, my own made up word). You know, I think everyone wanted a name change at some point, I got to change mine twice! (my parents were very indulging). Well I just kept switching my first name with my middle names. First was Rose and that lasted till 1st grade, then it was Chichi and that lasted till High School and then it was Natasha and that lasted till post college! People still call me all three and somehow I remember to respond. GORGEOUS!!!!! That water colour is INCREDIBLE!